Hey guys! You might have noticed last week that we mentioned wanting to make our styled shoots and real weddings more useful tools for brides and grooms, not only looking for inspiration but for help and advice too. After collecting the results of our recent reader survey (more on that later this week!) we can officially say that after our DIY’s, our real weddings are officially the second most read post on our blog, which is great for us because we absolutely love sharing them. However, as with our styled shoots, it has become apparent that, although they are a great source of inspiration, they aren’t as helpful as they probably could be? You want to know more about the whys and the hows of the planning process? What did our real wedded couples fear or worry about most? What didn’t tjey do and wish they had or what were the things they did do and wish they hadn’t? 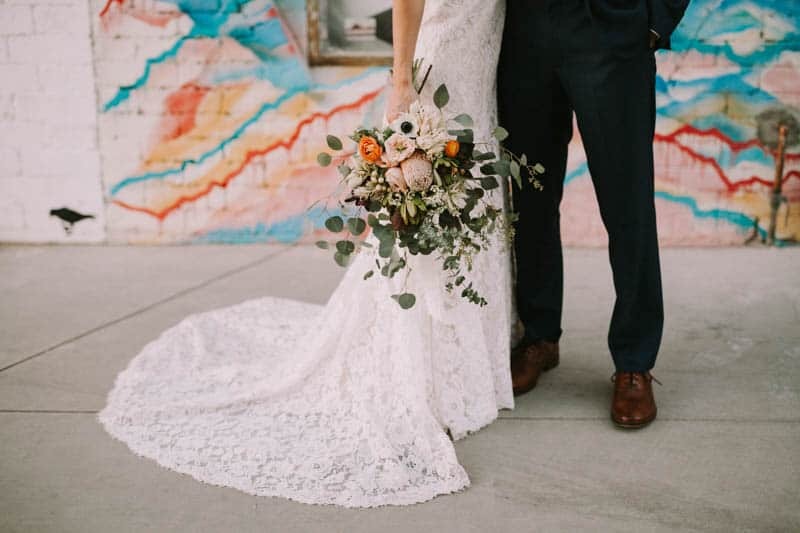 Which is why from now on, we will endeavor to once again make our real weddings as helpful as possible, starting with this super rad wedding in Downtown Phoenix. Jared & Brittany were married at the MonOrchid, an art gallery, restaurant, coffee shop, and green house; which pretty much makes for one sweet wedding location. First we wanted to know why the couple choose MonOrchid as their wedding location? And how they were able to source so many awesome suppliers? “We looked at a few other wedding venues but after meeting with the team at the MonOrchid, I was immediately sold!” Said the bride. Two things that were really important to Brittany & Jared was that their guests felt relaxed and entertained. “Since many of our wedding guests were from out of state, our number one goal was that everything was easy and fun. We wanted guests to be able to relax and have a good time! We decided to throw out the seating charts and let guests mingle at high tops and sit wherever they pleased.” She explained. Apart from the dinner arrangements the couple chose lots of other personal details too. Absolutely gorgeous, images are so beautiful and enchanting.